Whether you want a car that makes a visual impact, you’re seeking a high-performance vehicle, you need the convenience of a hatchback, or all of the above, you’re sure to be pleased by the Ford Fiesta ST. The 2018 edition of this popular hatchback leaves nothing to be desired in the level of comfort and performance that it offers and is available starting at just over $21,000. 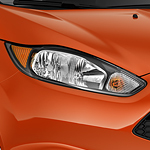 The Fiesta ST is powered by an EcoBoost engine that rivals those found in other high-performance vehicles, but the average gas mileage is still an enviable 26 miles per gallon in the city and 33 miles per gallon in the country. A highly responsive braking system is also designed to bring the Fiesta ST to a safe stop on any type of road surface and in any weather. Check out the 2018 Ford Fiesta ST by visiting Mullahey Ford for a test drive today.